Gail Chapman is a PhD student at the University’s Institute of Infection and Global Health. 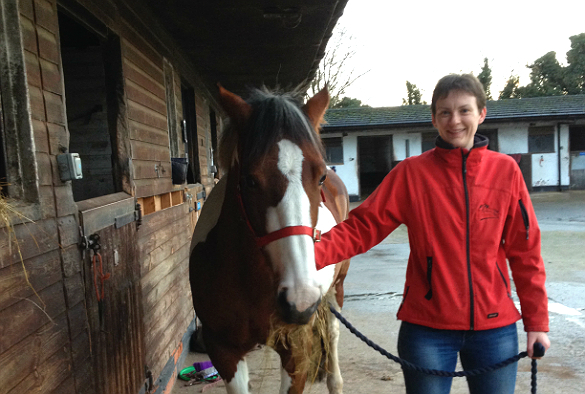 She is currently running the UK Equine Mosquito Threat Study. “My research focuses on the future risk to horses from mosquito-borne viral diseases. Biting insects are known to play a role in the transmission of diseases such as West Nile and African horse sickness viruses. While these particular viruses have never caused disease in the UK, our changing climate means there is an ever increasing risk of them being introduced. This would pose a serious potential threat to the health and welfare of a large number of animals, including horses. There are seven major mosquito-borne viruses affecting horses worldwide. These viruses are known as ‘encephalitis viruses’ because they are associated with swelling of the brain. In many horses these infections will cause only a short fever, which the owner may not even notice, but in a proportion of cases signs of illness will appear. I am a veterinarian by training, and spent ten years as a practicing equine vet. In taking stock of my career a decade in, I decided I needed a new challenge. I started to search for funded PhDs – there aren’t a huge number in equine health, but I came across one advertised on mosquito-borne disease and the rest is history! 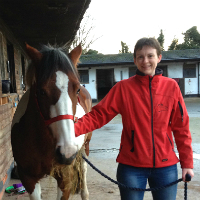 My project is funded by The Horse Trust and aims to address the lack of current information on the biology of mosquitoes found on UK horse premises. It involves a lot of variety including fieldwork, laboratory and molecular work with mosquitoes, survey writing and promotion, as well as all the associated analysis and writing. I began the fieldwork last summer and spent three months driving around England to trap mosquitoes on 32 equine premises. A transit van, a tent, sixteen traps and a lot of driving were involved. The results showed a variety of mosquitoes present on the study sites, and highlighted several species of interest to test for their ability to transmit virus. In order for this ability, the first step is to find mosquito larvae or pupae to rear to adults. Only females take blood meals and I need several hundred to thousands for a full virus transmission study. After about two weeks, as adults the females become hungry for blood, we take them to a high containment laboratory and infect them with virus using a special feeder. After another two weeks, the mosquitoes are anaesthetised and their saliva extracted. If the saliva contains virus then the mosquito is able to transmit virus from one animal (or human) to another. I am currently conducting an online survey to investigate horse owners’ knowledge about insects and infectious disease and their attitudes to the risks they pose, and to protection methods for their horses. The results of this survey are important in allowing us to assess what information are lacking, and would be useful to the horse owning public. A number of protection methods such as fly rugs, repellents and insecticides are used to help protect horses from flies, but there is no current recommendation available for what is most useful with regard to mosquitoes. So I will be testing a number of commercially available products to see how well they protect horses. This will involve screening eight products to choose the best two to test on horses in the field. This is quite a challenging study to design, and at the moment I am trying to develop a method that avoids me having to put my hand in a cage of mosquitoes (which is the standard protocol for testing repellents) as British mosquitoes are large, and in my experience give more irritating bites than tropical ones! For more information about Gail’s Equine Mosquito Study, including details on how to take part in the horse owners’ survey, please visit www.liverpool.ac.uk/equine-mosquito-study.